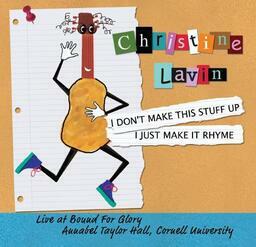 Christine Lavin : I DON'T MAKE THIS STUFF UP... I JUST MAKE IT RHYME : What Was I Thinking (1993-2007)? I thought . . . what have I done? before he finally says "I do"
Ah! Wat da tien na! Que lastima, La Vie, au revoir! Is this the worst of all fears? How do you feel about his four more years? Prince Harry said, 'hmmm . . . what shall I be? Batman? . . . No . . . Superman? . . . No . . .
come as you are, a putz! you didn't see me here?